Considering A New Concrete Driveway? Is A Concrete Driveway The Best Choice For Your Home? Which driveway surface is best when choosing between concrete, asphalt or permeable/interlocking pavers? What are the benefits of an concrete driveway vs asphalt or permeable/interlocking pavers? What type of ongoing maintenance does a concrete driveway require compared to an asphalt driveway or paver driveway? These are all very important things to consider when it comes to choosing a new driveway. Whether you call them concrete driveways or cement driveways… they’re both the same. How common are concrete driveways? The further South we travel in the United States, the more likely we see concrete and/or interlocking pavers. 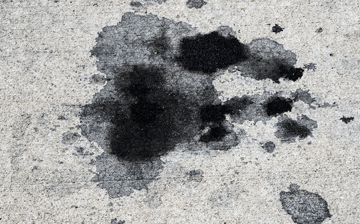 The further North we travel in the United States, the more likely we see asphalt. This is due to the limited amount of freeze and thaw cycles that occur in warmer regions. 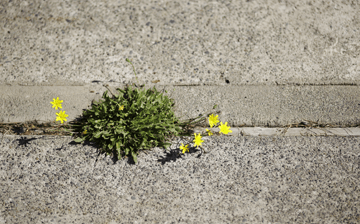 Unfortunately, concrete is not pliable like asphalt, therefore, freeze and thaw cycles can crack and damage concrete fairly substantially over time if it’s not maintained properly. Concrete is also prone to spalling from the use of salt and magnesium chloride de-icers. (See a video in our FAQ’s section about de-icers!) These de-icing materials are also used by local governments for winter road maintenance. As a vehicle drives on the roads, ice and snow builds up on the undercarriage. 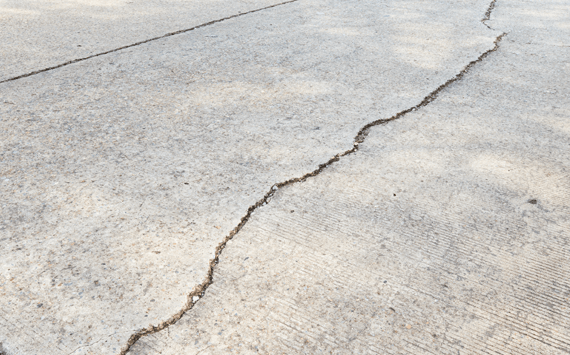 Then when the vehicle pulls into the driveway or garage and it falls from the car and melts, it then damages the concrete surface resulting in spalling, especially if the concrete was not installed properly. Sub-grade preparation can take anywhere from 1-2 days and up to 2 weeks, depending on the region you live. Based on the size and scope of work involved, the construction of a new concrete driveway can be installed by an experienced concrete contractor generally over a 2-3 day period after the sub-grade preparation has been done. Concrete driveway installation can be labor intensive and it also needs to cure for several days before being able to drive on it and use it, so you can expect the average concrete driveway to take as much as 7-10 days to install. Even more time may be required for patterned or stamped, stained or overlays. 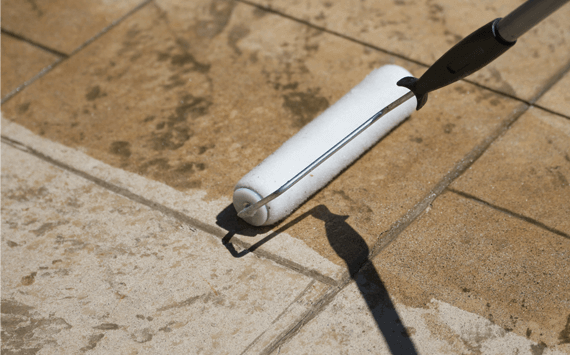 If you already own a concrete driveway and it’s beginning to show the signs of aging and exceptional deterioration, or has a tremendous amount of patching and repairs and looks patchy, blotchy and uninviting… removing and replacing it may be in order! This absolutely should be performed by a reputable concrete company that will do it right the first time by performing soil tests and determining if the sub-grade is suitable to re-install the concrete on the existing soil. If not, the soil should be excavated and new base or structural material installed for a solid, long lasting driveway. All driveways age and deteriorate and become a use and safety hazard. The goal with any driveway should be to maximize the life expectancy as much as possible before having to completely remove and replace it. This requires a solid plan with frequent maintenance of every 2 to 3 years. when comparing cost and #3 when comparing ongoing maintenance. A concrete driveway is the second most expensive driveway when comparing it to the other hard surface driveways. A concrete driveway requires the second least amount of ongoing maintenance, compared to the other hard surface driveways. A properly installed concrete driveway with regularly scheduled maintenance can last up to 25, 30 or even 35 years! That variation in age can be determined by the stability of the sub-grade, the quality of the installation, the type and frequency of maintenance, the drainage plan and the climate of the region you’re located in. expect to perform on a concrete driveway? New concrete should NOT be sealed until they are at minimum 3 to 4 weeks old. Concrete should then be sealed every 3 to 5 years thereafter to slow down the deterioration process. If you live in a snowy region and de-icers are regularly used in your area, standard gray concrete and stamped/colored concrete should then be sealed every 1 to 2 years to protect from salt and magnesium chloride. However, only a quality commercial grade concrete sealer is recommended and applied either by yourself or a reputable concrete sealing contractor. When cracks develop, they should be sealed as soon as possible. Ultimately cracks should be sealed every year or as needed. Sealing the cracks will help to prevent further damage and failures like alligatoring and potholes. Is Concrete Compliant with your HOA/Local Municipality? Be sure and check with your HOA (if you have one) or your local government municipality to make sure concrete is acceptable in the area you live. 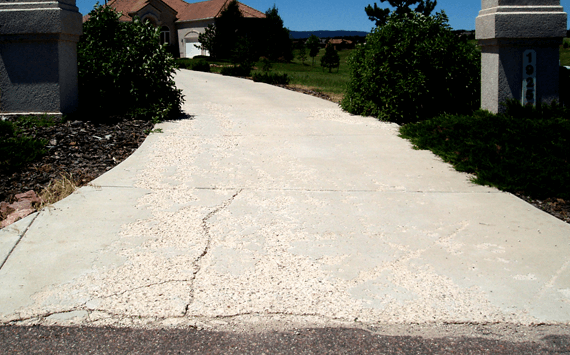 Since concrete driveways are the most common, chances are, it's what your HOA requires. Will Concrete Look Good In The Neighborhood You Live In? 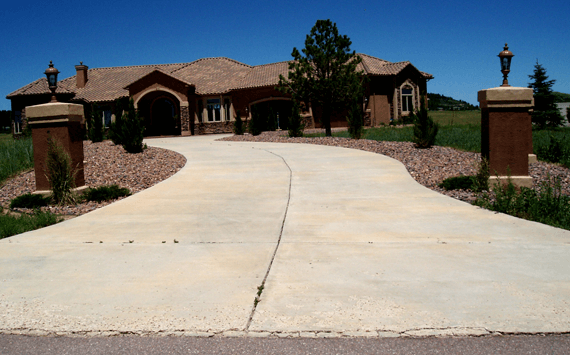 Will a concrete driveway look good in front of your home? Maybe a different type of driveway will look better. Have you explored your options? Will A Concrete Driveway Stand Up To The Elements? What is the climate like in your region of the country? Be sure and select a driveway type that make sense for your region. How Much Maintenance Does Concrete Require? If you want your driveway to last a lifetime, regular maintenance plays an important role in how long your concrete will last. Is Concrete Durable Enough For Your Needs? How much and what kind of traffic do you expect to use your driveway? Normal, everyday passenger vehicle use or heavy vehicle use? Select a driveway that make sense. Is Concrete Within The Budget? Select a driveway that fits into the budget short term and long term. Would a low maintenance or maintenance free driveway make better sense? 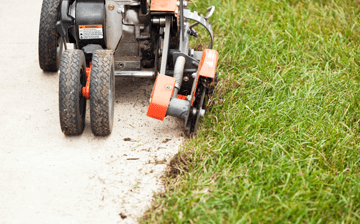 If the short term, up front cost is a deciding factor, Gravel Driveways and Asphalt driveways are excellent, low cost options, depending on the size of your driveway and the thickness requirements. The long term trade off, however, is gravel driveways and asphalt driveways require more ongoing maintenance. If cost is not as important of a factor, and aesthetics are more important, then a Concrete Driveway or Paver Driveways are the alternatives for your driveway. While initially the up front costs are higher, long term they require less maintenance therefore less maintenance costs. not maintained properly or how it can look as it ages. Unfortunately, concrete by nature cracks. When cracks develop, they should be sealed with a quality commercial grade concrete crack sealer. Sealing the cracks will help to prevent further damage and failures like alligatoring and potholes. Ultimately cracks should be sealed every year. This will most certainly save money long term avoiding costly patching services. This is tough to do since most concrete maintenance companies provide crack sealing services in conjunction with sealing, which can only be performed with temperatures of 50 degrees and rising. This is why in most areas of the country sealing is performed only in the summer months. Concrete driveways can be beautiful addition to your home. The wide variety of different colors and patterns to choose from can give your home a unique, one of a kind look. Stamped concrete, patterned concrete, colored concrete, concrete overlays, concrete staining and dyes. See some different Colorful Design Ideas For Concrete Driveways. When it comes to durability, keep in mind the amount of traffic and the type of traffic your driveway will endure. If your driveway will have to endure exceptionally heavy vehicles, an above average amount of heavier vehicle traffic, or an above average amount of water runoff, concrete may be the answer and long term solution. If you’re considering having a new concrete driveway installed, an existing one overlayed or one completely removed and replaced, see our Concrete Driveway Installation FAQ’s section for more information to ensure a good, quality long lasting job. You can also learn more about the ongoing maintenance of a concrete driveway by visiting our Concrete Driveway Maintenance FAQ’s section. Before you hire a contractor to install or perform maintenance on your concrete driveway, be sure and review our video and eBook series, “The Most Common Ways Concrete Contractors Rip Us Off And How To Avoid Them” ™ You’ll learn everything you need to know in order to hire a reputable contractor and get the job done right the first time! Or make it easy on yourself! Save time, money and future headaches by hiring one of our pre-screened and background checked concrete companies to install, remove and replace or perform maintenance services on your concrete driveway. Learn more or request an estimate from our pre-screened and background checked Concrete Installation & Concrete Repair Contractors in your local area. Last, if you would like to learn how to perform maintenance services on your concrete driveway yourself, visit our “Do It Yourself” Training Center for great tutorial videos and eBooks that cover How To Repair and Seal A Concrete Driveway. Send 1 email and get up to 3 estimates from our pre-screened and background checked concrete contractors!